Backpacking in Paria Canyon Slot Canyon! Wild Vistas Trekking offers an extraordinary selection of backpacking and hiking trips for groups. To ensure an intimate wilderness experience, all scheduled trips are limited to a maximum of 8 clients with no minimum (we guarantee our trips will go out even if only one person signs up). 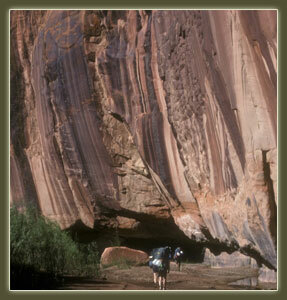 The following group trips currently scheduled in Escalante-Grand Staircase / Paria Canyon. Backpacking in Paria Canyon Slot Canyon! The silt laden waters of the Paria River have sculpted wild and twisting canyons of colorful sandstone revealing 200 million years of geological history. We enter the 2000 foot gorge near Page, Arizona and exit nearly 40 miles later at historic Lees Ferry where the Paria enters the Colorado. 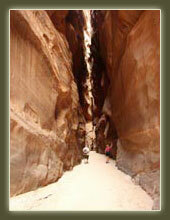 Along the way we pass through magnificent slot canyons and breathtaking vertical walls. The trip rated moderate and is based in St. George, Utah. Coyote Gulch is a side canyon of the Escalante river. It is a beautiful redrock canyon displaying arches, bridges, redrock formations, cascades, waterfalls and even some Anazasi Indian ruins. A wonderful trip for September. This trip will have several layover days to explore the nature of this unique setting, making for a trip rated moderate. The trip is based out of St. George, Utah. In a 40-mile gulch we will explore a lesser known Escalante River canyon. 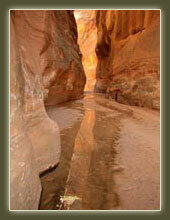 We will see slot canyons, ruins, pools and waterfalls, as well as sheer redrock canyon walls. Expect to find wonders around each bend and enjoy the beauty and the solitude as you explore where few others have been. This trip is rated moderate. The time of the year this special trip is offered should provide wonderful weather. The trip is based out of St. George, Utah.